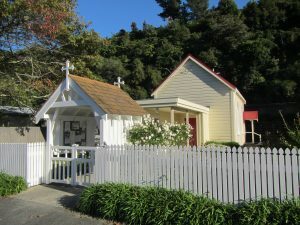 It all began in 1894, when Belmont was a rural area and residents experienced considerable difficulty in travelling to Lower Hutt to attend church services. A meeting of Methodist parishioners was held, when it was requested that services be held locally, and in that same year Mr J Kilmister offered the land for the site of a church. The building went ahead in 1897 at a cost of ₤100, with considerable savings as the construction was undertaken by four volunteers. The church was consecrated by the Reverend M. Gray. At first there was no harmonium and it is presumed the choir commenced its hymns with the aid of a tuning fork. The Sunday school opened with a roll of 30 and an added attraction for the children was Mr Kilmister’s orchard right next door! In those days, the railway ran close up to the back of the building. The trains used to make their presence felt during the services and the late Mr Ray Cowie remembered that, at evensong, the 7.15pm train would bring the sermon to a halt for a minute or so! By 1920, services were conducted at intervals by Methodist, Presbyterian and Anglican Lay Readers, in the main, although Archdeacon Hansell preached occasionally. Again, in 1966, Archdeacon Paddy Scott suggested that the same churches, now including the Associated Churches of Christ, conduct monthly family services in turn and all being agreement, this continued until very recently. In 1942 St James’ bought the building for ₤74 and in 1943 the extension to the front of the church was completed. When the Western Hutt motorway was constructed, the Ministry of Works required the land at the rear, and also the removal of the lean-to Vestry. They bought the property with the agreement that if it was still considered viable, the church could continue using it. The All Saints Sunday school roll was approximately 100 at that time, so the Ministry supplied three workingmen’s huts and these have proved very useful over the years for the Sunday school. Since then, St James has re-purchased All Saints and to quote Miss McKenzie who wrote the history for the 75th Anniversary “with loving care, the little church should stand for many more years”.